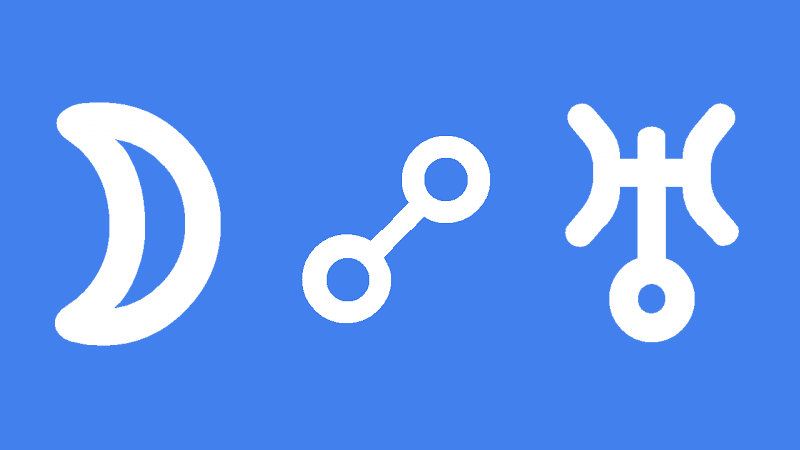 Moon opposite Uranus in the natal chart gives an exciting but unstable home and family life. These and other unusual domestic conditions are outward manifestations of your highly strung and erratic emotional life. Regardless of what your conscious intent may be, your feelings and reactions control the direction of your life. This is especially so for your close relationships. Your intimate relationships are where this aspect is most noticeable. Uranus creates emotional distance which makes it difficult to form close bonds with other people. This detachment will cause, or is caused by, your strongly independent and freedom loving nature. One of your parents, usually your mother, may have reinforced this inborn independent streak. Depending on other aspects and fixed stars, Uranus in your childhood could manifest as a scientific, astrologer, angry, abusive, crazy or absent parent. Whether a good or bad example, they influenced how you relate to people at the emotional level. An inability to make meaningful and stable relationships is common while you remain unaware of the erratic impact Uranus has on your subconscious feelings and reactions. Emotional turmoil, dramatic change and unexpected events can affect your home, family and close relationships. The key to reducing the unsettling impact of this aspect on your private life is to gain conscious awareness. Massive breakthroughs and personal growth can come through astrology, psychology and medicine. To enjoy more stability and control over your emotions and reactions, you want to slow down and calm down. The aim is to quieten your impulsive, erratic and unexplainable emotional reactions. Like so much in your life, compromise is needed to find the right balance between boredom and excitement. You cannot be the mad genius and the caring emotional partner at the same time. Transiting Moon opposite Uranus can cause emotional upsets and relationship turmoil. Whether self-inflicted or out of your control, the manner in which you react to change is critical. Impulsive reactions and emotionally based decisions could turn a minor drama into total chaos. Your stronger than normal need to be free is another disruptive force to be aware of. You may annoy or tease a loved one just to get attention. This is not the time for making important decisions, especially about relationships. Your instincts and intuition are not working properly. Chance encounters can lead to unexpected twists and turns. You are easily distracted and are subconsciously looking for excitement. Making new friends now would likely cause unwanted disruption in your life. Unexpected events, mood swings or emotional detachment can put a lot of strain on an existing relationship. Unexpected change can affect your home and family as well as intimate relationships. Your mother and women in general would be most affected by your erratic displays of emotion. This interpretation for Moon opposite Uranus transit can be read for a lunar eclipse or full moon opposite Uranus. Jewelle Gomez 0°15′, Jennifer Jason Leigh 0°28′, Princess Renee of France 0°51′, Schapelle Corby 0°58′, Taylor Swift 1°09′, Lord Louis Mountbatten 1°17′, Errol Flynn 1°18′, Carl Lewis 1°19′, John Fitzgerald (Jr.) Kennedy 1°38′, Princess Diana of Wales 1°42′, Liz Greene 1°49′, Harvey Weinstein 2°42′, Donald Trump 2°48′. And suffocation eventually leads to the smothering of ojes light of being or eternal flame, not 2illing to sacrifice either my mortality or immortality, we are not ever naturally expected to choose between them. Hi Jamie, thanks for this post, I was waiting for you to do this aspect and here it is! I have this aspect in my natal chart and it is exactly as you describe it manifesting, unfortunately. “Slowing down and calming down” is easier said than done with this aspect and volatile emotions. I have found this, so far, a life long challenge that I am making slow progress with through trying to be more conscious. I think as well for people with this aspect, it is helpful to manage this by really taking time to think about how the things you say/do really effect other people. It is easy to feel overwhelmed by your emotions in the heat of the moment but taking time to consider the effects your words and actions have really matter. Sometimes I stop and think to myself, “if someone said that to me, how would it make me feel?” ..Perspective. Like everyone else, people with this aspect want to have close loving relationships but are afraid of getting trapped or their emotions consuming them, its really hard to manage this. Anyone else with this in their natal chart got any tips? Similar to Debbbe I have a moon in the 12th house, wonder if this is significant for people with this aspect? Sometimes I feel totally emotionally bonkers, often it is for reasons I have been suppressing or trying not to think about/ignore or I’ve absorbed the emotions of others/or there is no logical reason. When I have an ’emotionally bonkers day’ now, the first step is to recognise that I am feeling emotionally volatile. I then try to feel my emotions (not easy) and let them come through me (I would say that is very challenging for people with this natal aspect). By doing this process, If I have thoughts such as “I can’t survive this feeling!”, “I feel like I am going to die/be killed (deep emotional response to negative thoughts) “I am going mad” then I try to do things which settle me/put me in a safe state. Sometimes that is interacting with others I trust, sometimes being alone so as not to cause damage to others/myself. Sometimes crying, sometimes talking about what’s on your mind/sometimes having a really deep dark brooding sessions. Today, for example, I felt like this and I thought “I feel like a total emotional wreck today”, but that;s OK. Today is just a total right-off and its OK to feel the way I do – tomorrow is a new day. Powerful levels of self-compassion needed and powerful levels of self-control/being mindful of your behaviours. Hi Jamie, Could this transit manifest as a mother behaving very dettached and distant to her family? Regarding females with this transit approaching, is it advised to not make hormonal changes (stopping birth control or hormones) or will they possibly just happen naturally with this transit? The mood swings and emotional stuff I’d prefer to not instigate if possible… ???? Yes Lisa that is just what you would expect. I think for making positive change you would want a sextile or trine. I have natal scorpio moon in the 8th square uranus in leo on the cusp of 4th and 5th house. Your description above does highlight the issues of this aspect. I have found physical exercise has helped me burn off excess energy and hyper energy. Bicycle riding and swimming is my saving grace. Princess Diana had natal Moon Uranus opposition. She has instant rapport with people. What a kind spirit she was. Compassionate and an altruistic humanitarian.